First sign you know you are getting old . . .
. . . I was called a "ma'am" today. I was walking down the aisle at Walmart when some young boys came running around the corner and one of them said "excuse me ma'am," NOT "excuse me miss", he called me "ma'am"
Times like this call for a good, down-right amazing, dessert. My mocha frosting reminds me of coffee ice cream. It has just enough coffee flavor and is perfectly sweet. 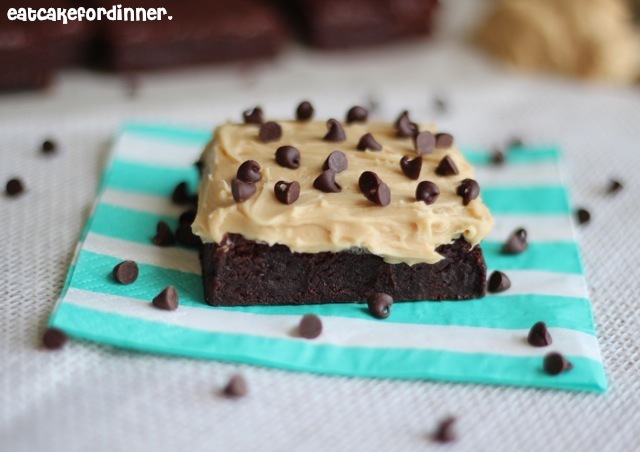 It's rich and creamy and pairs perfectly with a chewy chocolate brownie. I originally made a batch of homemade brownies that claimed to taste just like a box mix, but I thought they tasted horrible. They were way too bitter and needed way less cocoa and more sugar. I still have yet to find a chewy homemade brownie recipe that can beat a box mix. Does anyone have one? I ended up making a box mix and they were perfect, as always. So you only get a frosting recipe today and not a brownie recipe. Dissolve instant coffee in warm water; set aside. Beat butter, salt and vanilla until creamy. Add one cup of powdered sugar and the cocoa powder and beat until combined. Add dissolved coffee and mix until combined. Gradually mix in remaining powdered sugar, adding a little cold brewed coffee or milk, if needed, to reach desired creamy consistency. Beat for a few minutes or until light and fluffy. Makes enough to frost an 9x13-inch pan of brownies. This is my go to brownie recipe. I make 2 changes: omit the baking powder and mix in a 12 oz (2 cup) bag of your favourite chocolate chips. Honey, I just started getting "ma'am"-ed and I'm barely old enough to legally not be a minor. You're still young, haha. Let me know what you think of the frosting if you end up trying it! 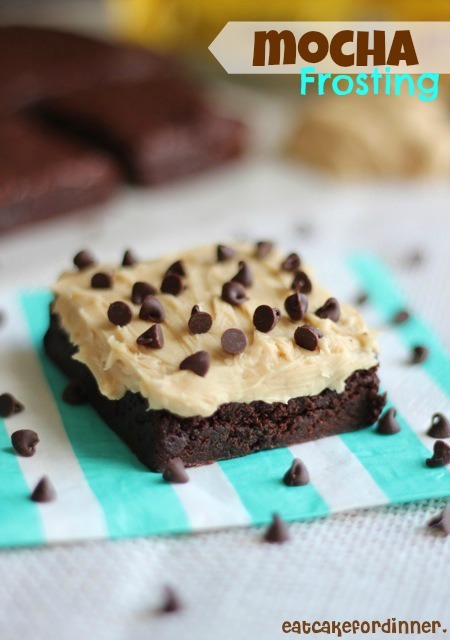 Here's a brownie recipe I love. It's from Better Homes&Gardens cookbook. They're a moist brownie if you like that kind, and they're pretty easy to whip up. Melt chocolate and butter in a saucepan. Mix sugar and eggs together and beat well. Blend in melted chocolate and butter. Add vanilla and flour. Pour in to a greased 8x8x2 square pan. Bake in a slow oven, 325 degrees for 35 minutes. Frost or sprinkle with powdered sugar. These are gorgeous! I just made mocha brownies the other day! SOOOO good. These look so pretty!! And yes, the ma'am thing.. It makes me feel old too!!! Im old so I belong here... Lol!..You have such mouth watering Mocha Frosting and I just want to grab from the screen and eat...and because of this I am happy to become your new follower.I love all your food here. Would you be interested to know about Filipino Fusion Food?..thats where my heart is..and I write about it. Thanks and have a blessed weekends..
Amazing blog and wonderful recipes! You have a new follower now, directly from Italy! Thanks - I'l give it a try!